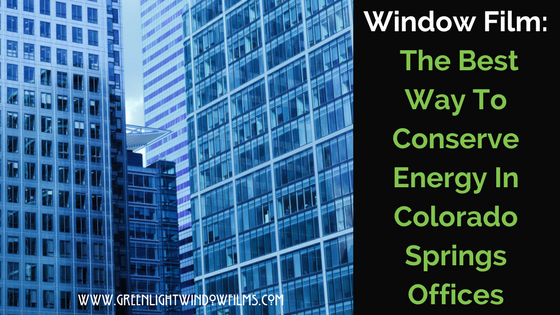 Can Window Film Help Your Colorado Springs Office Building Conserve Energy? Energy conservation is on everyone’s minds these days and for good reason– the cost of energy is high and the price is proving too high to pay both environmentally and financially. Also, conserving energy in a setting like an office building or highrise vastly increases profitability–plain and simple. So, if you own or manage an office building here in Colorado Springs, you should know–one of the best ways to get more money from your building and at the same time conserve energy is by having window film installed and it is more inexpensive than you may think. For more information about window film for your Colorado Springs commercial space, contact us at Greenlight Window Films today and get on the road to savings!